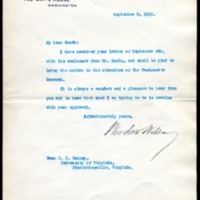 Woodrow Wilson writes to Richard Heath Dabney regarding Dabney’s recommendation of Mr. Burks for a postmaster position. I have received your letter of September 4th, with its enclosure from Mr. Burks, and shall be glad to bring the matter to the attention of the Postmaster General. It is always a comfort and a pleasure to hear from you and to know that what I am trying to do is meeting with your approval. Wilson, Woodrow, 1856-1924, “Woodrow Wilson to Richard Heath Dabney,” 1913 September 5, WWP20493, University of Virginia Woodrow Wilson Letters, Woodrow Wilson Presidential Library & Museum, Staunton, Virginia.